One of the "Band of Brothers" died yesterday at the age of 90. William "Wild Bill" Guarnere, who was portrayed by Frank John Hughes in the HBO miniseries "Band of Brothers", died of a ruptured aneurysm at Jefferson University Hospital in Philadelphia. Guarnere received the Silver Star, Bronze Star with cluster, Purple Heart with two clusters, and the Croix de guerre with palm, among other decorations. 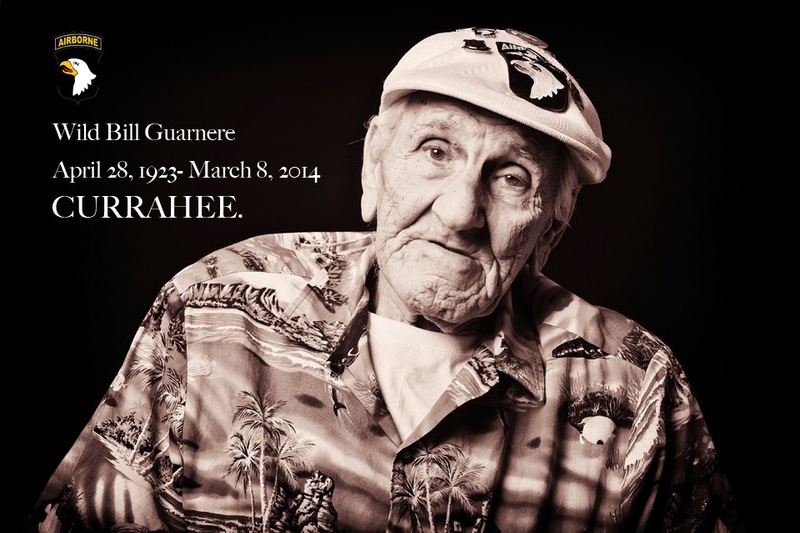 Guarnere was one of the authors of a best-selling memoir about Easy Company, 506th PIR, 101st Airborne: Brothers in Battle, Best of Friends. Edward J. "Babe" Heffron, Guarnere's co-author, died 96 days ago (on 2 December 2013), also at the age of 90. The exploits of Easy Company, 506th PIR were popularized by Stephen Ambrose's book Band of Brothers and the HBO miniseries made from it. If you read, you should read Band of Brothers. If you don't read, watch the miniseries, then read the book. If it interests you, read Donald Burgett's Currahee! and its sequels as well. They are sanitized, as many stories of war are, but they are also powerful. I prefer Burgett's books to Ambrose, but that may be because I read Currahee! decades before Band of Brothers was written. The 506th PIR first trained at Camp Toccoa in Georgia. They adopted "Currahee!" a Cherokee word which they believed meant "we stand alone" as their regimental motto. They did training runs up Currahee Mountain. When we were visiting Normandy, our guide suddenly turned off the main road and took us to Angoville-au-Plain. According to our guide, the church at Place Toccoa in Angoville-au-Plain become a medic post where two American medics from the 501st PIR set up shop. Robert Wright and Kenneth Moore, both of the 2nd Battalion treated anyone who needed it, so long as they left their weapons outside. During the night, at least one bomb pierced the roof of the structure and hit the floor, but did not explode. For reasons unexplained, the church was shut almost immediately after the war and remained so for many years. It is alleged that the pews still show the bloodstains of the soldiers treated here. I can vouch only that they have dark stains. Inside the church are several stained glass windows, one of which depicts an American paratrooper. Stained glass in the church at Sainte-Mere-Eglise, also showing American paratroopers. Private Ardean Vernatter from the 506th didn't make it past D-Day. This stone is in the American cemetery at Colleville-sur-Mer, overlooking Omaha Beach. According to our guide, every year about 1,400,000 visitors come to this little piece of America in France. Eight hundred thousand of those visitors are French, four hundred thousand are American, and many of the remainder are German. According to the visitors brochure (PDF), the cemetery is 172 acres in size and has 9387 stones (9238 crosses, 149 stars of David), including 41 sets of brothers (I erroneously indicated 33 in my previous post) and 3 Medal of Honor recipients, whose names are lined with gold leaf. The names of 1557 MIA soldiers are engraved in the Garden of the Missing. It's worth the trip all by itself, but while you're there, walk down to Omaha Beach, too. This is the view of the beach out to sea -- roughly what the defenders might have seen at low tide. And this is the view up the hill. Just stand and listen. Try to imagine what it must have looked and sounded like as 50000 soldiers with their landing craft, vehicles, rifles, mortars, and explosives lay on this beach under withering fire. Can you hear the screams? Can you hear the prayers? Close your eyes. Can you see the blood they claim still comes from the rocks? Can you see and hear the fear, the anger, the pain, the dying? Some people think that the raw emotion of awful things can stay in a place. I think it might be true here. Godspeed, Wild Bill. Godspeed. You deserve Valhalla.